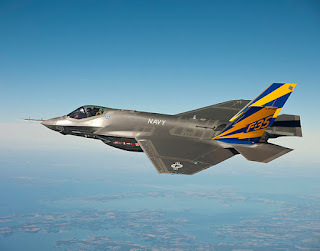 What do you think of this: spending over $1 trillion over the next twenty years for 2,400 stealthy F-35 Joint Strike Fighter jets? That's over $400 million per plane. The helmets that the pilots will wear, alone, cost over $400,000 a pop. Bernie thinks it's a good idea. Hillary thinks it's a good idea. Trump and Cruz and Rubio and Jeb all think it's a good idea. So much for finally finding something that we can all agree on. The amount of money being wasted here is mind-boggling. And wasted is the right word, since no compelling case has been made that this weapons system boondoggle will do anything to address our genuine national security concerns. This number of better things that we could do with this vast sum is itself mind-boggling. We could provide free college and vocational training for young people for decades. Teachers could be paid the kind of salaries that would allow us to recruit and retain the best and the brightest of them. Our crumbling infrastructure could be repaired or replaced if need be. World-class public transportation systems could be built that would become the preferred way for everyone to get around. Sources of clean energy could be developed and our environment restored in the process. And, for a relative pittance, no city, town, or village in the country would have to settle for providing its residents with anything but the highest quality drinking water. So why is everyone behind such a bad idea? The reason is that the United States has become a warrior culture; you can stake out any position you damn well please across the political spectrum, but you can't say anything that in any way could be construed as calling into question the premise of unrivaled and enduring American military power around the world. Military spending has become the "third-rail" of American politics. No one dares touch it.